What does the Gesture Beam 102 come with? Does te Gesture Beam 102 Have DMX capabilities? Does it have a Slave mode? What does the each of the DMX channels do on the Gesture Beam 102? Does the Gesture beam 102 have a Sound Active mode, how do I setup Sound-Active Mode? How do setup the Sound-Active Sensitivity? How do I setup the Gesture beam 102 with a controller? Does the Gesture Beam 102 have a limit for Pan & Tilt? My Gesture Beam 102 appears to be malfunctioning 30 feet in the air. What can I do? Does the Gesture Beam 102 Have DMX capabilities? Yes, it does! The Gesture Beam 102 has the traditional DMX IN and DMX OUT jacks built in. This will allow you to use these lights with a qualified DMX controller, and with the proper DMX Cables. The Gesture Beam 102 does have a Slave mode. What does each of the of the DMX channels do on the Gesture Beam 102? There a 4 different channel modes to select from 3,7,15, and 22 channel modes. See below what all 22 channels will allow you to control. Connect a DMX cable from the DMX output on the DMX controller that you are using, and attach it to the DMX input on the Gesture Beam 102. Below is a picture showing this. The Powerlink feature lets you link multiple Marq Lighting Gesture Beam 102 moving heads together with power cables (IEC cables). One reason to do this may be if you have a shortage of wall outlets or power supplies to plug multiple units into. You can then power all of them when having just one Marq Lighting Gesture beam 102 connected to a wall outlet. Insert the included power cable into the wall and then the other end into the Marq Lighting Gesture Wash 10. On the opposite power plug on the Marq Lighting Gesture Beam 102, you will see a power jack that works the opposite way. On this jack plug the opposite end of an IEC cable here. Now plug the other end of the power cable into the power jack of another Marq Lighting GestureWash 102. This will supply power to the Marq Lighting Gesture Beam 102. 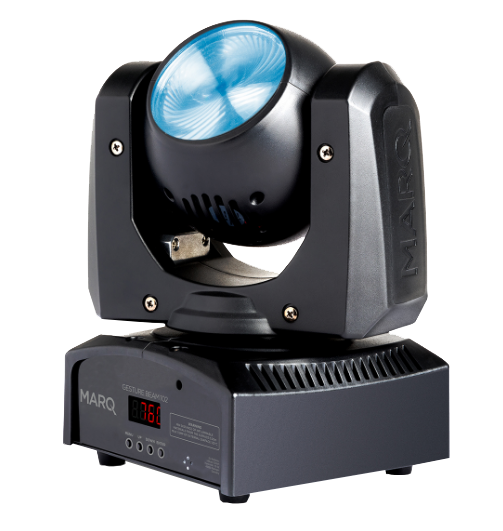 The Marq Lighting Gesture Beam 102 has a 3.4-degree beam angle on both sides of the fixture. It is possible to reset the Gesture Beam 102 from the DMX controller (only if in 22 channel mode). On channel 22, send the Reset All DMX value between 200 - 209, for more than 2 seconds to reset the entire fixture. This is a soft reset that restores the Gesture Beam 102 to the power on state.